Dust storms on Mars aren’t all about dust — they’re also full of water. A satellite orbiting Mars has taken the most detailed measurements yet of how these rare events trap water at lower altitudes, which may help reveal what happened to the water that used to be abundant on the Red Planet. 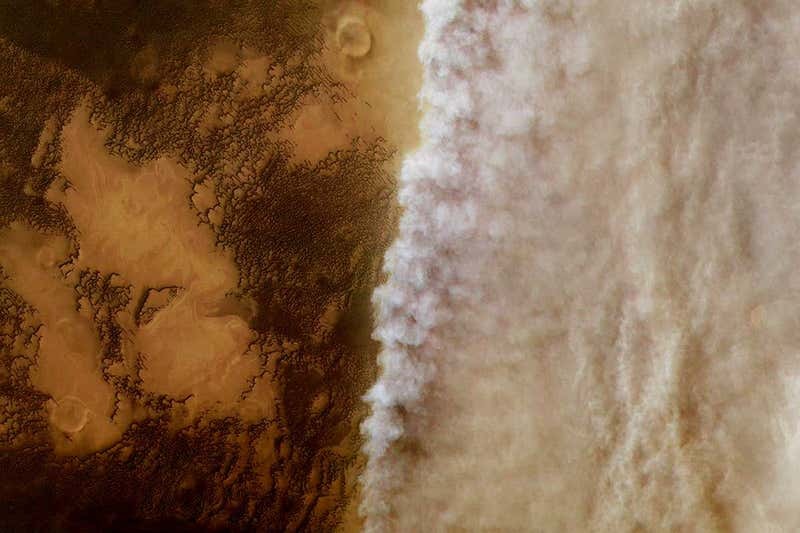 In 2018, the largest recorded dust storm circled the entire Martian globe, so thick that it hid the surface from the sun and killed the Opportunity rover. The ExoMars Trace Gas Orbiter watched this cataclysmic storm from orbit. Just before sunset and just after sunrise on Mars, it examined the atmosphere to determine how the dust storm absorbed sunlight. Ann Carine Vandaele at the Royal Belgian Institute for Space Aeronomy and her colleagues used this data to determine how water was behaving in the storm. They found that just before the storm, there were water ice clouds in the atmosphere, but no water vapour more than 40 kilometres above the surface. This changed a few days later when water vapour appeared at altitudes of 40 and 80 kilometres, seemingly replacing the water ice clouds. Long ago on Mars, water carved deep riverbeds into the planet’s surface—but we still don’t know what kind of weather fed them. 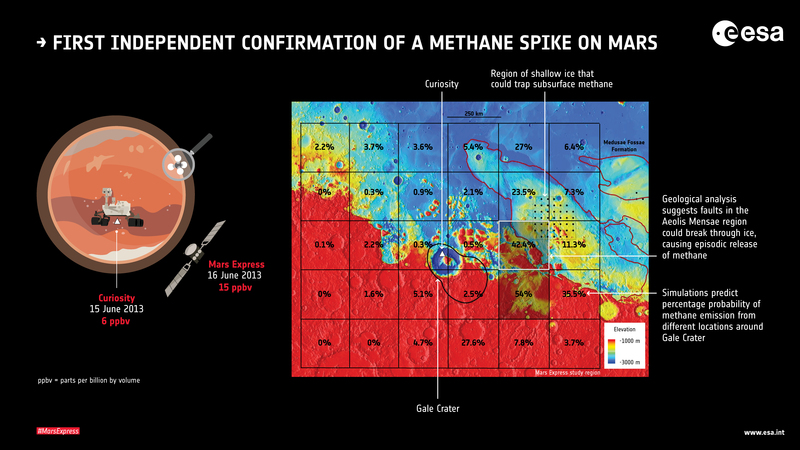 Scientists aren’t sure, because their understanding of the Martian climate billions of years ago remains incomplete. A new study by University of Chicago scientists catalogued these rivers to conclude that significant river runoff persisted on Mars later into its history than previously thought. According to the study, published March 27 in Science Advances, the runoff was intense—rivers on Mars were wider than those on Earth today—and occurred at hundreds of locations on the red planet. But it’s a puzzle why ancient Mars had liquid water. Mars has an extremely thin atmosphere today, and early in the planet’s history, it was also only receiving a third of the sunlight of present-day Earth, which shouldn’t be enough heat to maintain liquid water. “Indeed, even on ancient Mars, when it was wet enough for rivers some of the time, the rest of the data looks like Mars was extremely cold and dry most of the time,” Kite said. Seeking a better understanding of Martian precipitation, Kite and his colleagues analyzed photographs and elevation models for more than 200 ancient Martian riverbeds spanning over a billion years. These riverbeds are a rich source of clues about the water running through them and the climate that produced it. For example, the width and steepness of the riverbeds and the size of the gravel tell scientists about the force of the water flow, and the quantity of the gravel constrains the volume of water coming through. Their analysis shows clear evidence for persistent, strong runoff that occurred well into the last stage of the wet climate, Kite said. 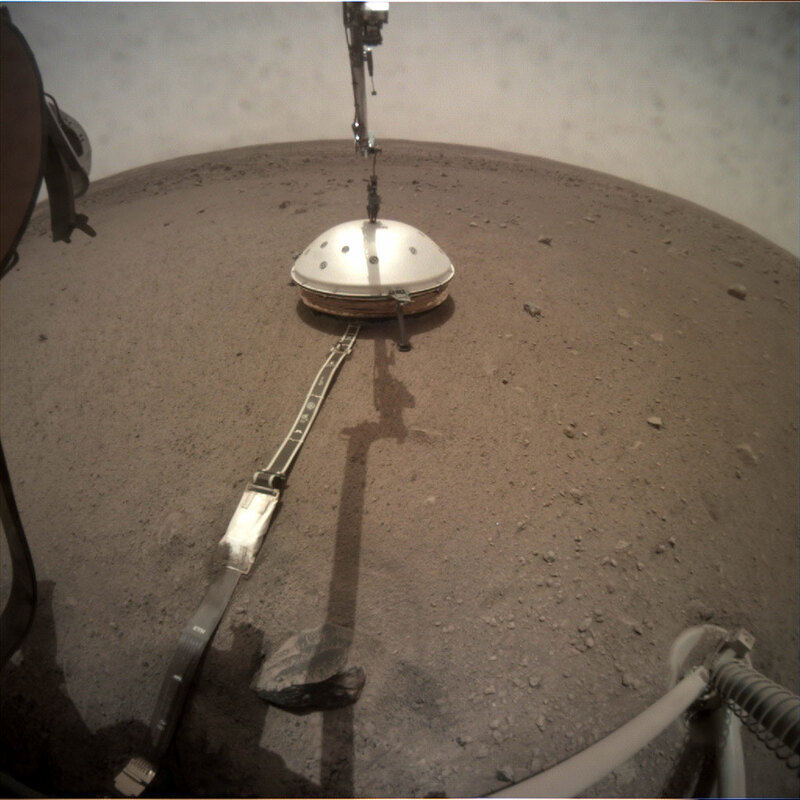 After months of delicate maneuvering, NASA’s InSight lander has finished placing its hypersensitive seismometer on the surface of Mars. The instrument is designed to solve mysteries about the planet’s interior by detecting the booming thunder of “marsquakes.” But just a few weeks into its run, the car-size lander has already heard something else: the minute tremors that continually rock our red neighbor. If marsquakes are the drum solo, these microseisms, as they’re known, are the bass line. The signal first became apparent in early February, as soon as the lander placed a protective shield over the seismometer, said Philippe Lognonné, a planetary seismologist at Paris Diderot University who heads the team that runs the instrument, in a talk here today at the annual Lunar and Planetary Science Conference. “We do believe that these signals are waves coming from Mars.” This is the first time, he said, that such microseisms have been detected on another planet. On Earth, microseisms are ubiquitous, caused largely by the sloshing of the ocean by storms and tides. Mars, despite the dreams of science fiction writers, has no present-day oceans. Instead, this newly discovered noise is likely caused by low-frequency pressure waves from atmospheric winds that rattle the surface, inducing shallow, longer-period waves in the surface, called Rayleigh waves, Lognonné said. NASA’s InSight lander is busy deploying its Heat Flow and Physical Properties Package (HP3) into the Martian soil and has encountered some resistance. The German Aerospace Center (DLR), who designed and built the HP3 as part of the InSight mission, has announced that the instrument has hit not one, but two rocks in the sub-surface. For now the HP3 is in a resting phase, and it’s not clear what will happen next. The HP3 is designed to measure the heat coming from Mars’ interior and to tell us something about the source of that heat. 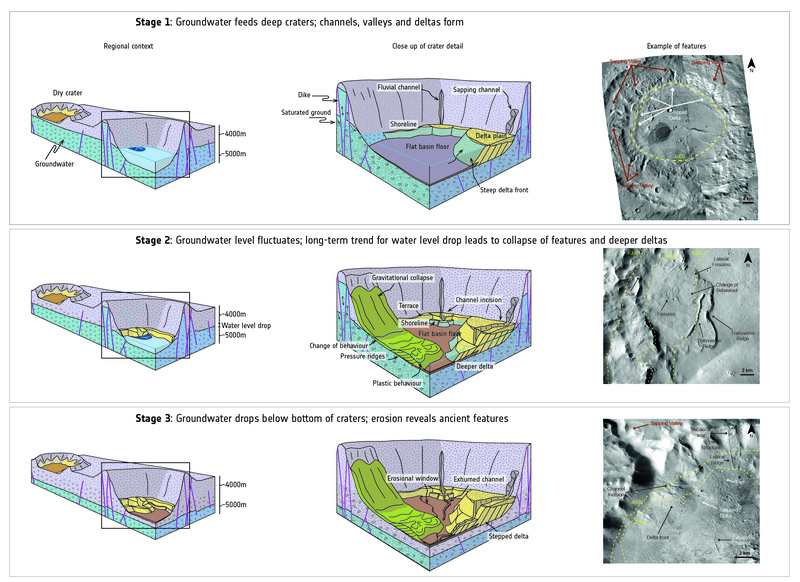 The basic idea is to determine how Mars formed, and if it formed the same way Earth did. It’ll also tell us something about how rocky planets in general form and evolve. But to do that, it has to get underground. The HP3 uses a hammer system to pound itself into the ground. It works in phases, spending about four hours at a time hammering into the surface. But all that hammering creates a lot of friction and heat, so the HP3 rests for a couple days while things cool down. Then it measures the heat before continuing the cycle. Mars Express has revealed the first geological evidence of a system of ancient interconnected lakes that once lay deep beneath the Red Planet’s surface, five of which may contain minerals crucial to life. Mars appears to be an arid world, but its surface shows compelling signs that large amounts of water once existed across the planet. We see features that would have needed water to form – branching flow channels and valleys, for example – and just last year Mars Express detected a pool of liquid water beneath the planet’s south pole. A new study now reveals the extent of underground water on ancient Mars that was previously only predicted by models. “Early Mars was a watery world, but as the planet’s climate changed this water retreated below the surface to form pools and ‘groundwater’,” says lead author Francesco Salese of Utrecht University, the Netherlands. 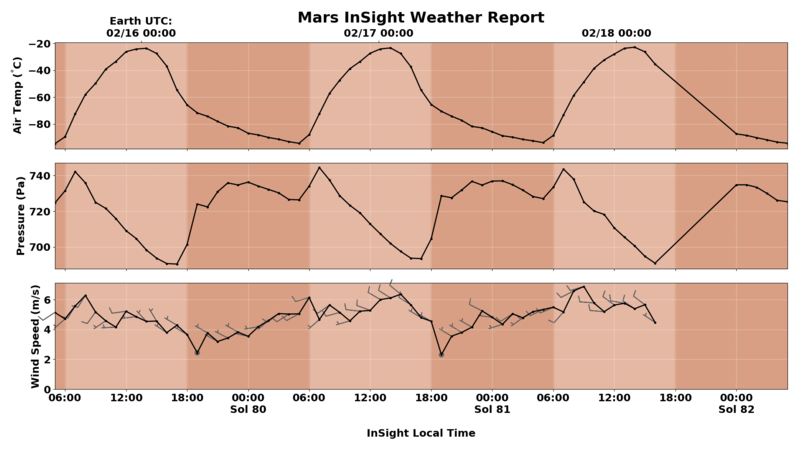 Martian hourly weather data for Saturday, Sunday, and Monday. Note the kinks in the air pressure curve at 07:00 and 19:00 daily. There’s a new meteorologist on Mars. Although NASA’s InSight spacecraft landed on the red planet late in 2018 to measure the planet’s geology—primarily by listening for Mars quakes—it also brought some sophisticated meteorology equipment with it. The space agency has set up a website to share that information, which includes not only daily high and low temperatures but also unprecedented hourly data on wind speed, direction, and air pressure for InSight’s location near the equator in Elysium Planitia. “We thought it was something that people might have some fun with,” Cornell University’s Don Banfield, who leads InSight’s weather science, told Ars. Other spacecraft have brought comparable temperature and wind sensors to Mars before, but none have carried such a precise air pressure sensor. The new sensor is 10 times more sensitive than any previous instrument because InSight needs to detect slight movements in the Martian ground, and from such movements infer details about the red planet’s interior. For this, weather matters. The Martian atmosphere may be very thin—typically it varies between 700 and 740 pascals at the surface, less than one percent of Earth’s surface pressure—but it nonetheless can induce slight tilts in the Martian surface. The air pressure sensor will therefore help scientists calibrate the lander’s seismometer so that any tilting due to higher or lower air pressure can be filtered out of the data. It’s actually pretty amazing that even so thin an atmosphere can have a slight effect on the Martian surface and that InSight’s seismometer is sensitive enough to detect it. 2019. Centered at the enormous canyon system Valles Marineris, also featuring some or Mars’ tallest mountains, including Olympus Mons—the tallest mountain in the solar system—on the west coast. Created by SHI Weili, For this project, Terra Mars is a speculative visualisation by an ANN (artificial neural network) to generate images that resemble satellite imagery of Earth modelled on topographical data of Mars. Terra Mars suggests a new approach to creative applications of artificial intelligence—using its capability of remapping to broaden the domain of artistic imagination. SHI welcomes different interpretations of Terra Mars. It can be enjoyed simply as a playful remix of the two planets, or one can relate this imaginary version to the astronomical facts. Maybe one can even consider this as a preview of a possible outcome of human’s terraforming efforts, or you just appreciate the sheer beauty of a planet that resembles our own. “Apparition” is the term astronomers use for the appearance of an object over some course of time. For Mars, it means when it first appears west of the Sun in the morning sky, after being lost in the glow. Earth moves faster in its orbit, so we catch up to Mars and pass it. When we’re closest to Mars and it’s opposite the Sun in the sky we say it’s at opposition. Mars rises at sunset and becomes an evening object. After that the Earth pulls ahead, Mars recedes, and some months later approaches the Sun from the east until it’s lost in the Sun’s glare once again, this time at dusk.